My Week in Art: Oil and water don't mix! Ever since I started painting, I've favoured scenes with sunlight and shadow. I love the hard contrasts of dark against light, warm against cool. And it's not that it makes painting easier, it just happens to be what catches my eye even when I'm not actively seeking out things to paint. On the one or two occasions where I've painted on overcast days, the results have been less than spectacular. 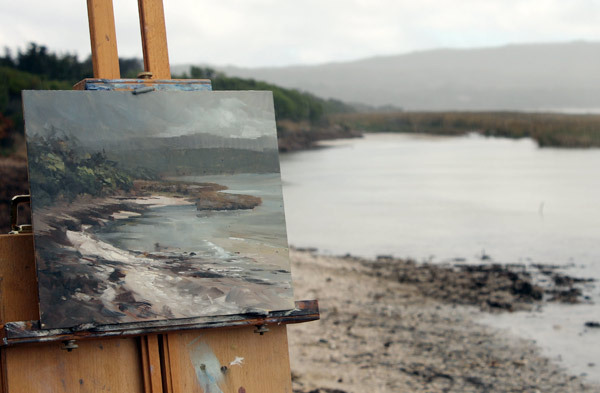 And yet, I see other artists turn out beautiful paintings on what can best be described as dreary days. Their skies are grey, their landscape is grey, nothing is bright and shiny - but the end results of their efforts are very appealing. With autumn here and the clouds already rolling in, I decided that this year I was going to push myself to paint outdoors on overcast days. With that in mind, I headed out to the coast yesterday afternoon to see if I could find some grey-day inspiration. I finally found something that looked promising and started to paint. Ten minutes in, it started to rain. It wasn't cold so I just kept painting. Here's the palette after about 20 minutes. The painting itself had almost as much water sloshing around on it. Then it stopped raining for a while, before starting to rain again. "Oh, this is fun", I thought to myself. 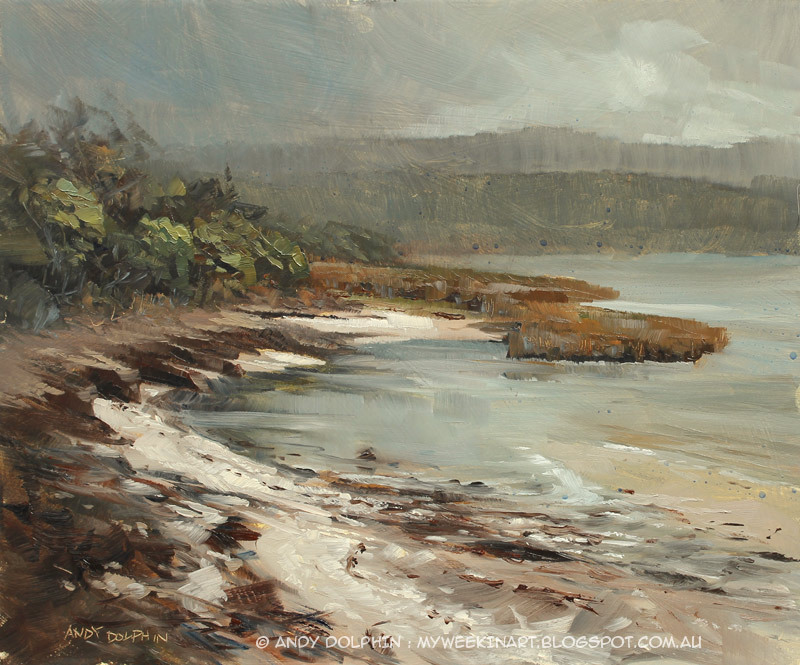 It's actually lucky that oil ad water don't mix, otherwise my painting would have little more than a puddle on the shell-grit beach. 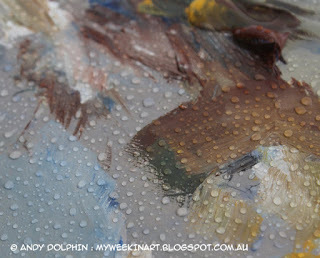 As it was, the oil repels the water just enough to allow you to keep working. But it was messy and it took a bit of effort to get paint off the palette, onto the brush and then onto the painting. Anyway, after a little over an hour, I ended up with something that shows promise. Here's the location shot taken just before the next lot of rain arrived. And here's the finished piece. This quiet little beach offered an interesting shape, a range of textures and colours and some stark tonal contrasts even on this very cloudy day. I took this photo this morning. If you click to enlarge the pic, you'll see some dried-out rain drops are still there. So, it's not fantastic but it is something. I'll mess with it a bit and see what I can salvage from it. That’s a lovely painting and thank you for sharing, how wonderful to be able to paint plain air; I can just about manage to sketch. I have to work in my studio can’t seem to settle to paint anywhere else, wish I could though. What’s the secret? Hi Ashar, thanks for your comment. I don't think there is a secret. It's not necessarily easy, but it's doable. For me, the breakthrough came when I discovered Marc Hanson's blog and saw that in April 2009 he had committed himself to doing four plein air paintings a day for the whole month. He painted morning and evening, and even at night and sometimes in snow. 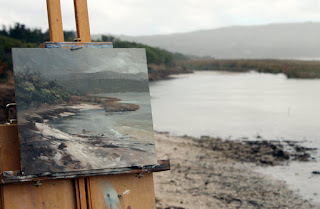 After I read through his blog, I realised I had no excuses not to try and paint outdoors more. If he could do four a day, I could surely do one or two a week. And that's when I started this blog in an effort to push myself a little. Basically, you just have to do it. I still find it a struggle sometimes but it's much easier than it used to be. And absorbing as much input as you can from other artists makes it all come together a little easier still. You could start by trying paintings with just one colour and white. Burnt sienna works well for this. I love the atmosphere on this one. Well done, looking forward to your polished results. That's what John always calls you, so I feel I know you as Andrew. I like both names, Andrew and Andy. I gave my son the Middle name Andreu which is the Catalan equivalent to Andrew.